A recent attack has shaken Serbia’s LGBT community. Will the 2014 Belgrade Pride go ahead? Two scenarios are possible, largely depending on the pressure the EU will decide to exert. “Over the last three years, the EU seem to have turned a blind eye to the bans of the Pride Parade, as long as Serbia made progress in other, more important, matters, like the normalisation of relations with Kosovo”, writes Koen Slootmaeckers. Prajd 2014 from ParadaPonosaBeograd on Vimeo. Last Saturday, a German participant of the international LGBT (Lesbian, Gay, Bisexual, and Transgender) conference “The future belongs to us: LGBT rights on the road to the European Union” was attacked in the centre of Belgrade. Although the perpetrators, according to witnesses, shouted, “we don’t want foreigners here”, which could point to xenophobia, the attacked was generally portrayed as a homophobic attack. The organisers of the conference decided to cancel the remainder of the programme, and held a press conference followed by a protest march through the streets of Belgrade. Although the motives of the perpetrators remain unclear, the framing of the event draws attention to the LGBT rights situation in Serbia. Furthermore, the fact that this attack occurred only two weeks before the 2014 Belgrade Pride (scheduled for 28 September) raises once again questions on whether the Pride will be held this year. The Pride Parade in Serbia has a rocky history. After almost a decade of failed attempts to organise it, the first (and only) successful Pride was held in 2010. The event was successful in the sense that none of the participants got injured – in comparison to the unsuccessful 2001 Pride, which resulted in dozens injured participants. However, the riots following the 2010 event destroyed significant parts of Belgrade leading to damages of more than one million euros. In the three following years, LGBT activists have tried to organise more Pride Parades in Belgrade. The Serbian government, on the other hand, decided every year to ban the Parade, citing threats to the national security as reason. To date, the EU reacted weakly to the Pride’s ban, by sending mixed signals to the Serbian government – this in spite of the fact that Serbia is a signatory to several international conventions, such as the European Convention on Human Rights, which protects LGBT people from discrimination and secures the freedom of assembly, and has pledged to improve its record on human rights protection as it moves towards EU membership. Although the freedom of assembly of LGBT people is seen by the EU as a litmus test for human rights protection within Serbia, the EU in the last three years seem to have turned a blind eye to the bans of the Pride, as long as Serbia made progress in other, more important, matters, like the normalisation of relations with Kosovo. This trade-off becomes clear when we analyse the progress reports of Serbia. While the EU repeatedly regrets the ban of the pride, it is only in 2013, after the Brussels agreement was signed, that the EU Progress reports pointed out that by banning the Pride parade the Serbian government showed a lack of political will to tackle the precarious situation of LGBT people in Serbia. Furthermore, the prioritisation of LGBT rights in the 2013 enlargement strategy paper shows that now regional stability has been achieved (to a certain extent) the EU can finally start focussing on other issues, like LGBT rights. At the domestic level, similar trade-offs were made. Whilst allowing the Pride parade to take place in 2010 was advantageous for the Serbian government to show that it was serious about ‘Serbia’s path to the EU’, the political costs in subsequent years where simply deemed too high. In 2011, the government was concerned with the conflicts at the Kosovar border and upcoming elections. Holding a Pride in these conditions would have been politically too costly, as PM Dačić made clear in his statement that “[i]n the situations where aggression in Northern Kosovo can begin at any moment, […] the gay pride [is] the last thing we need”. The 2011 Pride ban did not alter the EC’s opinion on Serbia’s candidacy, while Kosovo remained the key priority in the EU membership negotiation process. Serbia drew its lesson, and made the same calculation in 2012 and 2013. With regards to the 2014 pride, a few questions remain: Will the Serbian government make a similar calculation for the upcoming 2014 pride? Or did the Brussels agreement and the increased scrutiny of the EU on LGBT rights make banning the pride too politically costly? And more importantly, how will the recent attack influence the government’s decision on the 2014 pride? Regarding the last question, two scenarios are possible, the one more unlikely than the other. First, the Serbian government might use this attack to justify the security threats and decide to ban the pride. The second scenario is that due to the attack, pressure by the EU and Germany to hold the Pride will increase, and that the parade will become a Serbia’s symbolic statement to show its readiness for the EU accession negotiations. However, statements of both Serbian and German officials in the last couple of days make the first scenario increasingly unlikely. The German Federal Government Commissioner for Human Rights Policy Christoph Straesser already stated during the conference on Friday that the Pride parade would be a very strong signal to the EU. During a meeting with PM Vučić the day after the attack, Straesser reiterated that a safe and successful Pride would have a tremendous meaning for Serbia. Vučić, on the other hand, stressed in an official statement that the state would do everything to ensure the protection of human rights. He, furthermore, said in an interview that “we have shown that the state seriously opposes and fights against xenophobia and homophobia. We will see in the weeks ahead how successful have we been on this front,” suggesting that the Pride will go ahead. A decision, however, has not been made so far. Although the odds for a 2014 Belgrade Pride were already more favourable compared to last year, the attack on the German LGBT activist increased international scrutiny, increasing pressure on Serbia to hold the Pride and show its commitment to the EU and the protection of human rights, including those of LGBT people. Koen Slootmaeckers is a PhD candidate at Queen Mary University of London. His doctoral research focuses on the impact of EU Accession processes on the LGBT movement in the Western Balkans. Koen is also a research affiliate at Leuven International and European Studies (LINES) at the University of Leuven (Belgium), where he currently works on an edited volume entitled: The EU Enlargement and Gay Politics: The Impact of Eastern Enlargement on Rights, Activism and Prejudice (Palgrave, 2015). He tweets @kslootmaeckers. This entry was posted in Current affairs, Serbia and tagged EU accession, European Union, Germany, human rights, Koen Slootmaeckers, LGBT, Pride, protests, Serbia. Bookmark the permalink. 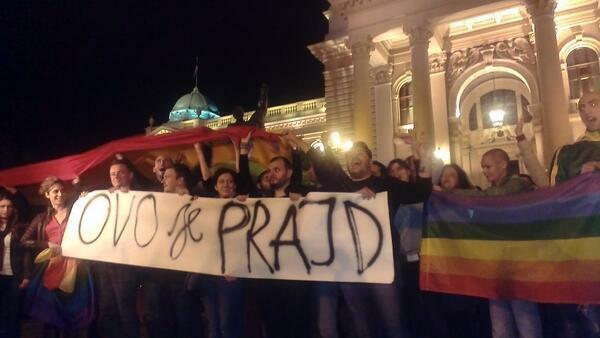 One Response to Belgrade Pride 2014: Another blow to the head or will it go ahead?